The elephant is an ancient powerful animal that enjoys particular respect in some Eastern countries, such as India and China, as well as in countries of the African continent. Local residents represent an elephant with such qualities as wisdom, peacefulness, patience, insight, love. According to the ideas of Buddhism, the elephant is a sacred animal. It harmoniously combines physical strength and spiritual principles, and therefore is an example to follow and worship. In many countries: India, Thailand, Sri Lanka, statues of elephants standing on the altar, along with figures of other divinities. Feng Shui experts believe that the figures of elephants placed inside the house in certain places that can bring its owners wealth and well-being, calmness and confidence the wisdom and power of the spirit. From the point of view of the teachings of Feng Shui, all of these material and spiritual blessings elephant drawn into the room through a long trunk. Statue of an elephant with down trunk is designed to protect and safeguard young children. It helps to establish a strong, friendly, and trusting relationship between parents and their children, and favors the birth of healthy strong kids. This figurine can be a wonderful talisman-amulet for a pregnant woman. According to Feng Shui, not only statues of elephants have a powerful force. The image of the sacred animal is able to perform the same function as talismans. And the figures of elephants can be made from various materials: bronze, ceramic, steel, porcelain, crystal, bones. Talismans can also serve as a soft plastic or rubber toys. Mascot elephant itself is very powerful and strong. However, he loves and appreciates all kinds of jewelry of semiprecious or precious metals: necklaces, chains, bracelets, rings. 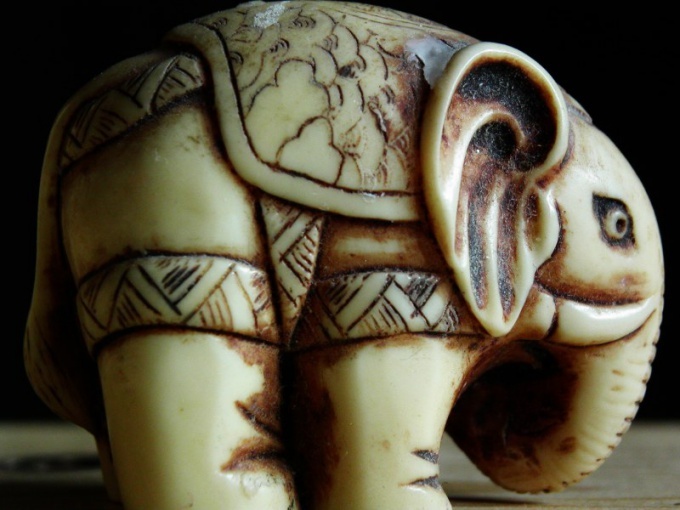 Avoid decorations made of ivory. Put on the talisman, they turned his power against the occupants of the house. It is important to choose mascot the right place in the room. Elephant figurine made to put on the window sill, the trunk must be directed to the street. The elephant is able to neutralize the negative energy coming from the corners of the room. If the trunk is directed into the room, this means that the elephant must keep the family all achieved spiritual benefits. When selecting a location for installation of the figurines of elephant, prefer Northwest or Southeast sides of the apartment. Talisman placed in these areas, supporting the head of the family or are attracted to a reliable patron. Most importantly - to the cherished mascot began to act and to bring into the house of love, wisdom, peace and prosperity, a person needs to sincerely believe in the power of the selected figures of the elephant.